In a little over a month from now, Samsung will unveil the Galaxy S10 in San Francisco, marking the tenth anniversary of the best-selling Android flagship lineup. It’s been a rollercoaster ride over the last few months, with Galaxy S10 rumors and leaks showing up almost every other day. The information was sometimes conflicting, but at this point, things have become pretty clear as far as major aspects of the phone are confirmed. So come join us as we dig into what one can expect from Samsung’s next flagship smartphone. One of the biggest changes the Galaxy S10 will bring is in the number of variants that will be available for sale. 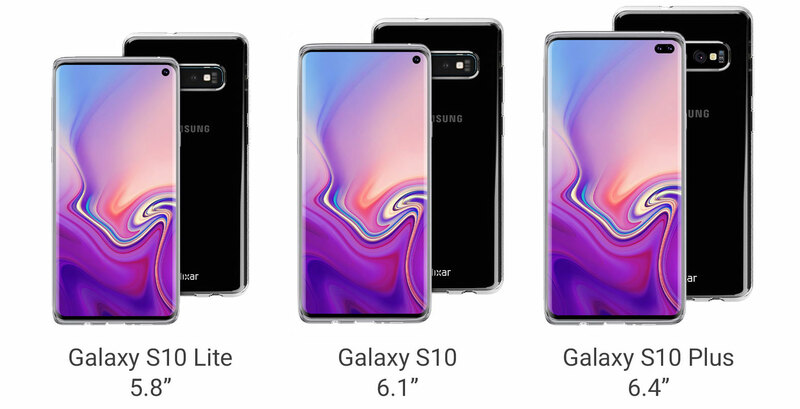 Samsung will be offering the Galaxy S10 in three different sizes: the 5.8-inch Galaxy S10 E, the 6.1-inch Galaxy S10, and the 6.4-inch Galaxy S10 Plus. The Galaxy S10 will also have a fourth variant, with 5G support and possibly a 6.7-inch display, but availability will be limited since not many markets will have 5G networks in place for the foreseeable future. It’s not fully clear what these three S10 models – or that 5G version – will be called. The base model is supposedly dubbed Galaxy S10 E, but the overall branding will remain the same, as confirmed by Samsung’s official launch teaser. Yes, Samsung has decided that a notch isn’t the future, but the company has come up with an alternative many may find just as bad. The Galaxy S10 will have a cutout on the right side of the display for the front camera in order to offer a larger screen-to-body ratio. 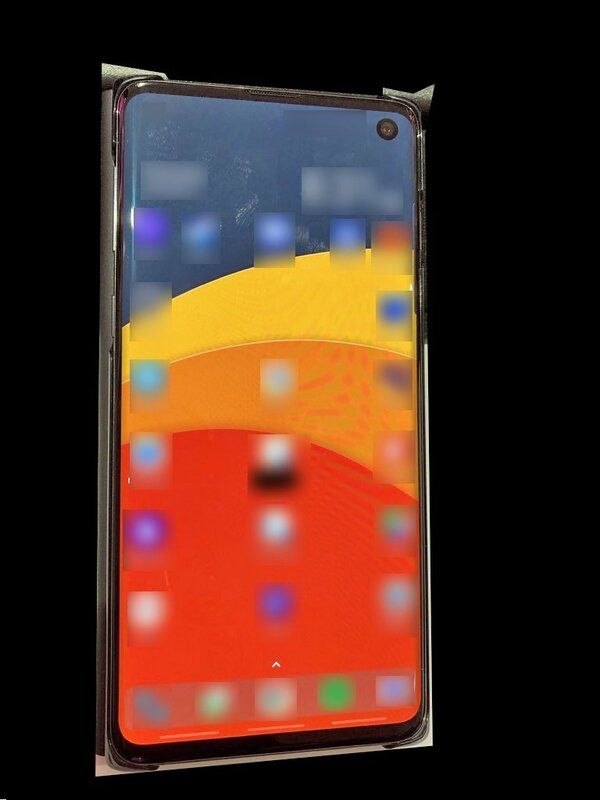 Yet, the bezels may still be noticeably big, as revealed by a leaked photo of the 6.1-inch Galaxy S10. And while the Galaxy S10 E and Galaxy S10 will have only a single front camera, the Plus model is expected to get two selfie shooters, so it may not be the most sought-after version for many Samsung fans despite its otherwise top-end specs. Samsung is also making another important change: the Galaxy S10 E is not expected to have a curved screen. The S10 and S10+ will, but the curves will be much less pronounced this time around. Of course, lovers of flat displays will probably have an issue with even the slightest curve, so the base model may find more takers this year. However, it remains to be seen what the E in the Galaxy S10 E will stand for. It can’t be short for Edge if there is no curved screen. And if it’s E for economy, well, that’s a title you don’t want for a flagship smartphone, even if it’s the base model. There have been rumors of Samsung turning to in-display fingerprint sensors for a long time, but we will finally see them on the Galaxy S10. Indeed, leaked renders and case images have shown no fingerprint sensor on the back, and with an iris sensor likely missing because of the smaller bezels, an in-display sensor simply has to be there for consumers to take the S10 seriously. Sadly, the S10 E will make do with a side-mounted fingerprint sensor, something we can confirm based on our sources. That has also been suggested by the same leak that told us the cheapest S10 may be called the Galaxy S10 E.
Galaxy S10 camera: Up to six total cameras? Samsung first put a dual camera setup on a flagship with the Galaxy Note 8 in 2017. Things have progressed at a rapid pace since then, or at least the competition has. With Huawei and other OEMs (such as Oppo) offering up to three rear cameras, Samsung decided to jump on the bandwagon last year with the Galaxy A7 (2018) and Galaxy A9 (2018), which come with three and four rear cameras respectively. And this year, we will see those multi-camera setups on the Galaxy S10, although there is going to be some variation depending on the model. The Galaxy S10+ is expected to have five total cameras: two at the front, and three at the back. The three rear cameras could include a 12-megapixel Dual Aperture lens as the primary rear camera, a 123-degree 16 MP (f/1.9) wide angle lens, and a 13 MP f/2.4 lens for telephoto and bokeh capabilities. Details on the front cameras, meanwhile, are currently unknown. The same goes for the fourth camera sensor that some reports have suggested will be seen on the Plus model and also the 5G model. As in stands, the lack of any details means there may not be a quad-camera setup on any model. Things are also a bit hazy when it comes to the S10 E and the S10. Recent leaks suggest that both phones could have three rear cameras and one selfie camera, but it’s possible the Galaxy S10 E will come with only a dual rear camera setup. Again, it’s not totally clear at this point. The only thing that can be said for certain is that each Galaxy S10 model will have three total cameras at the very least. Samsung could also offer a number of new software features for the Galaxy S10 camera. One of them is expected to be Bright Night, a take on Google’s Night Sight feature for Pixel smartphones that uses different exposure settings to create impressive photos in the dark. And with the F1.5 lens on the Galaxy S10 (same as the Galaxy S9 and Note 9), such a feature could perform better than the competition. Another software trick could be Artistic Live Focus, although details on what this will do are unavailable at the moment. Yes, you’re not reading that wrong. The 5G Galaxy S10 model could actually have a 5,000 mAh battery, according to a usually accurate source. But we’re more concerned about the three models that most consumers will be able to buy, and they might not be as exciting. The Galaxy S10 E has been confirmed to have a 3,100 mAh battery, only 100 mAh higher than the Galaxy S9, while the S10 and S10+ could have 3,500 mAh and 4,000 mAh batteries respectively. Those are the same as the S9+ and Note 9, but efficiency should be higher thanks to the 8nm Exynos 9820 and 7nm Snapdragon 855 chipsets. Samsung is also reportedly bringing faster charging with the Galaxy S10. We have seen the company stick to the same fast charging specifications since the Galaxy Note 4, but that could finally change this year. And that’s not all: the Galaxy S10 could even wirelessly charge other phones! We know this feature is being developed, although it’s not going to be anything more than a gimmick going by the implementation on competing devices like the Huawei Mate 20 Pro. All Galaxy S10 models will be powered by the Exynos 9820 processor in most countries, while some (like the US and China) will get it with the Snapdragon 855. 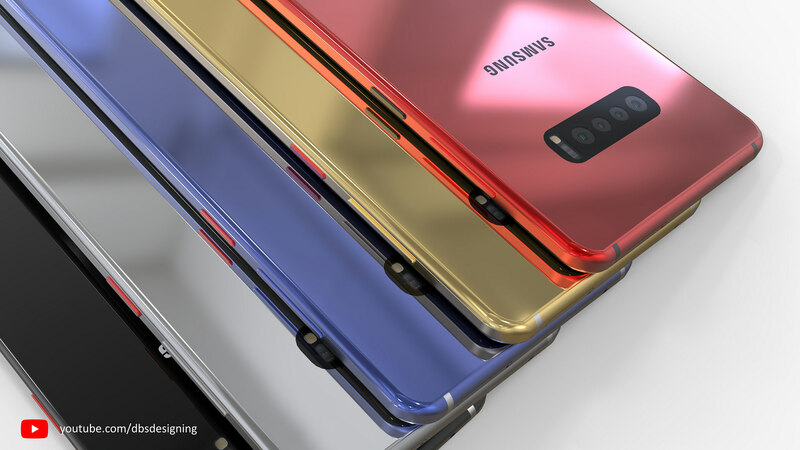 Both the S10 and S10+ should come with 6GB of RAM and 128GB of storage on the base version and 8GB of RAM and 512GB storage on the higher-end version. The Galaxy S10 E has been spotted with 6GB of RAM, but there’s a chance it may come in a 4GB RAM configuration, especially since our sources tell us the cheapest S10 will have a variant with 64GB of storage. The Galaxy S10 could also use the new UFS 3.0 storage standard, which offers double the bandwidth of the UFS 2.1 standard in use on current Galaxy flagships. And like the Note 9, 512GB microSD cards should be supported. There’s even rumors of a S10+ variant with 1TB of storage built-in, but there’s not enough information available on that front as yet. We can expect a few features to carry over as is from previous Galaxy S flagships. These include IP68 water and dust resistance, AKG-tuned stereo speakers with Dolby Atmos support, a USB Type-C port, the dedicated Bixby button (along with Bixby 2.0), Samsung Pay support, and a heart rate sensor. On the software front, the Galaxy S10 will run Android 9 Pie out of the box with Samsung’s One UI skin. Like every other flagship, it should get two major Android OS upgrades, although it would be great to see Samsung extending that number to three considering even budget Galaxy J smartphones are now getting two major updates. The Galaxy S10 will also be among the first Android phones with support for Wi-Fi 6, as confirmed by the FCC approval for all three models. Wi-Fi 6 enables better performance in places with a lot of devices connected to the router, although benefits will only be seen after a few years once Wi-Fi 6-enabled routers start making their way into homes. Samsung has a habit of launching new color options for its flagships a few months after a device goes on sale, and we can expect that to happen with the Galaxy S10 as well. At the moment, the initial launch colors for all models are expected to be white, black, green, blue. 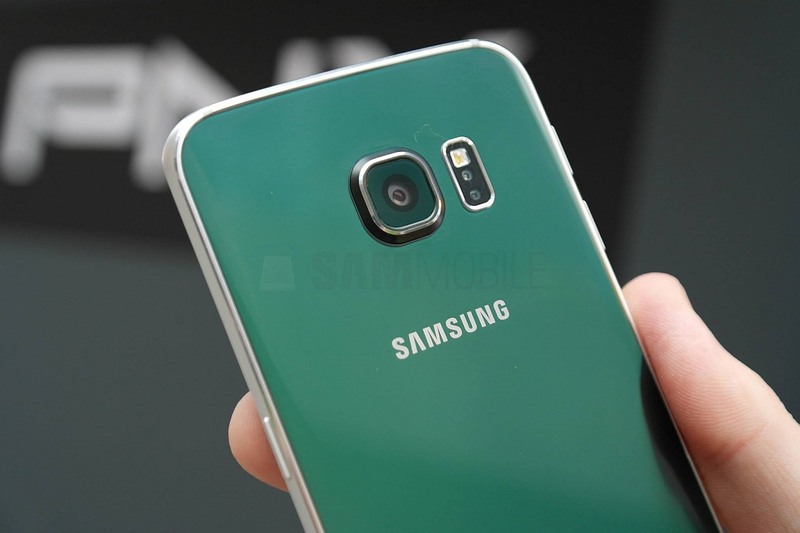 Yes, green is making a comeback this year, which should make a lot of folks happy considering the green Galaxy S6 was so popular back in 2015. And while the Galaxy S10 E will miss out on some important features compared to the S10 and S10+, it will have the privilege of being the only variant to also come in yellow. The yellow version may be exclusive to some markets, but we can always hope Samsung will make an exception later on if it sees good demand. Last but not the least, we had also learned that Samsung was working on a Galaxy S10 with a ceramic back. This would be the 5G variant, although there isn’t enough evidence to support the existence of such a model, so we’ll suggest not keeping your hopes up until we learn something new in the coming weeks. The Galaxy S9 hit retail shelves around 18 days after it went official while the Note 9 took around 15 days, so we can expect the Galaxy S10 to go on sale by mid-March. As far as pricing is concerned, one report said the 5.8-inch Galaxy S10 would start at £669 ($850) in the UK for 128GB of storage, while the Galaxy S10+ could be priced at £899 ($1,130), £1,099 ($1,390) and £1,399 ($1,760) for the 128GB, 512GB and 1TB variants respectively. The 6.1-inch S10 could be sold at £799 ($1,000) and £999 ($1,250) for the 128GB and 512GB models respectively. Yes, the $1000 mark looks set to be breached by the Galaxy S lineup this year, but can we really blame Samsung? There’s a lot the Galaxy S10 will offer, and those who don’t want to spend too much will have the Galaxy S10 E as an option. Of course, pricing information is far from official at the moment, and we will have to wait until launch day to get any concrete details. A major error make a version, in this article called E, with so much differences to the other brothers. Just no sense to call it S10. It’s just a A… with a better CPU. In my opinion this can be a shoot on the feet Samsung. Samsung phones are too much advanced, and those are noticed well after 6 months from launching. S10 will be widely accepted from June 2019 worldwide, everyone will love this masterpiece. Good luck Sammy happy 10th anniversary of Galaxy series. Why do they try so hard reaching for failure? The only “rationale” I could see is that they want a slow growth in order to not risk being over-valued by investor a creating a default for next year, therefor they try their best at selling the least possible units. But that 10mp image is an oversampled image that uses the information gathered by the 40mp sensor to create a much better picture. AND if you want to shoot at 40mp,you can. The same can’t be said for these 12mp shooters. And that’s why Samsung has fallen behind the competition and WILL continue behind the likes of Huawei. They’re insisting on old cameras and not innovating at all. Where you saw 1TB card ?